This shop has been compensated by Collective Bias, Inc and its advertiser. Mornings around here can certainly be a little crazy. Leaving very little time to make a healthy breakfast before heading out to face the day. 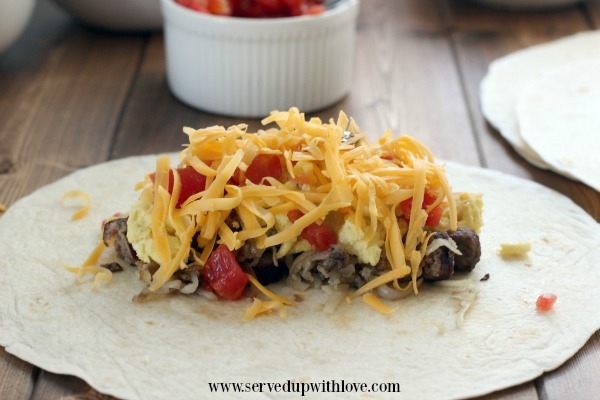 Breakfast Burritos are a great option to have a protein packed breakfast and keeps us from reaching for those sugar laden breakfast items. 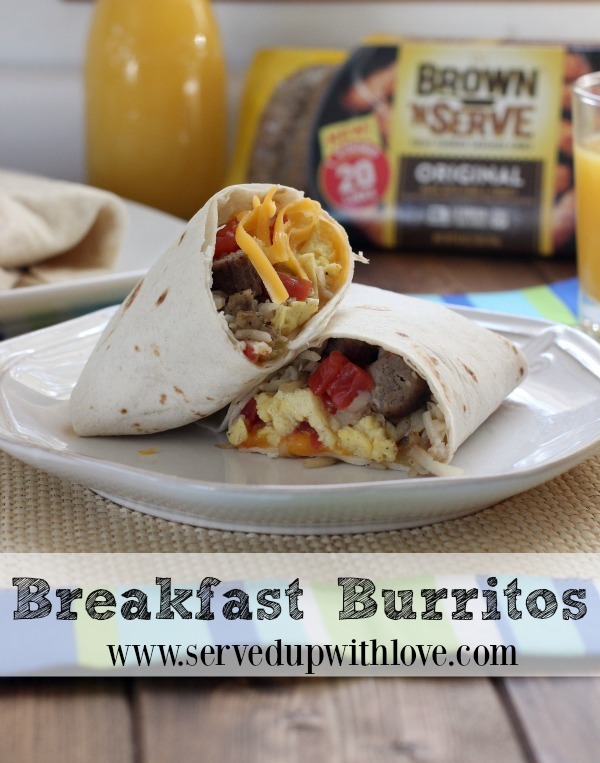 These burritos can be made ahead of time and kept in the freezer until you are ready to head out the door. These Brown 'N Serve sausage links are so convenient. They can be ready in the microwave in 30 seconds or 3 minutes on the stove. A full pound of sausage done within minutes! We all need some shortcuts and this one makes this mom very happy. These were a huge hit with my family and will be made a lot more often. 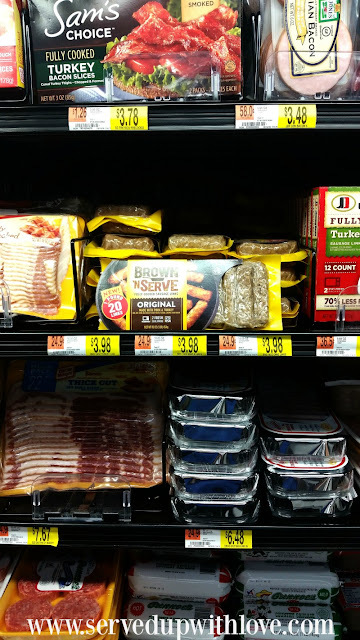 I do most of my grocery shopping at Walmart and found these links along with the bacon, hot dogs, and such. I grabbed the original links to use in this recipe but I love the option of Maple and the Turkey too. To save money while shopping, here is a $1 rebate for Brown 'N Serve links at your local Walmart. It is just something about that sizzle! Hash brown potatoes are a favorite and so easy to make. Add a little oil in the pan, salt, pepper, and your favorite seasoning. Let them brown, stirring occasionally. 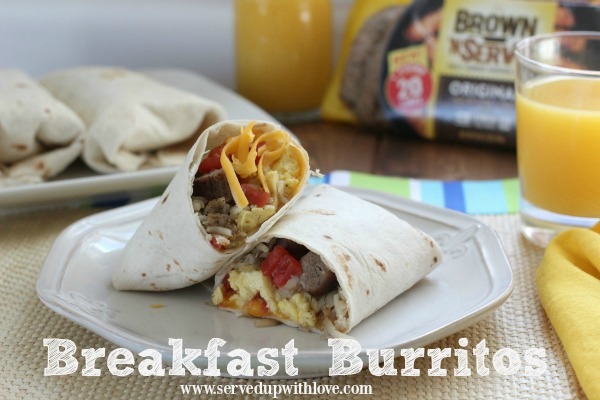 A breakfast burrito has to have some protein packed eggs. Cook on medium heat, stirring frequently until done. Arrange your assembly line to make the burritos. I used the larger burrito tortillas but if you prefer a smaller burrito, use soft taco size tortillas. Now it is time to assemble. 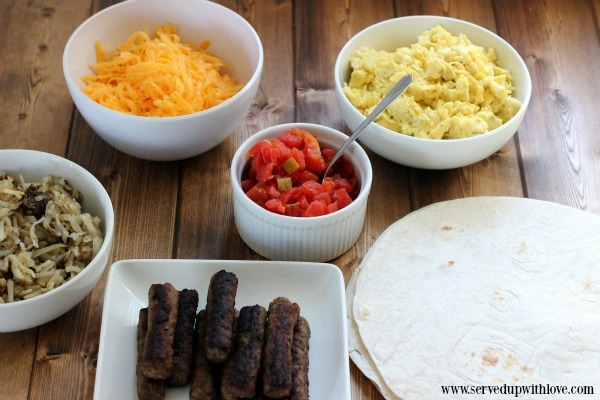 Chop up the Brown 'N Serve sausage links and place a line of them in the middle of the tortilla. Add all your toppings in any order you prefer. There is no rhyme or reason here, just load them up. Chopped sausage links, eggs, hash browns, Rotel tomatoes (optional) and sharp cheddar cheese. Fold in the shorter ends and roll up the sides tightly. Place seam side down on a platter and continue to assemble all the burritos. Make a little or make a lot. To make these even easier, whip these up and freeze them for mornings when you have even less time to get out the door. Wrap them in plastic wrap and place in freezer bags. Pull out what you need that morning, place in the microwave for 1 -2 minutes and walk out the door with a nice, hot breakfast that will keep you full until lunchtime and your hand out of that box of donuts. Breakfast doesn't have to be boring or a chore to make. These Brown 'N Serve sausage links in Original, Maple, or Turkey make it so much easier to keep your bellies full and satisfied. So tell me, How do you make mornings easier? Cook the Brown 'N Serve sausage links, set aside. Shred the cheese and set aside. 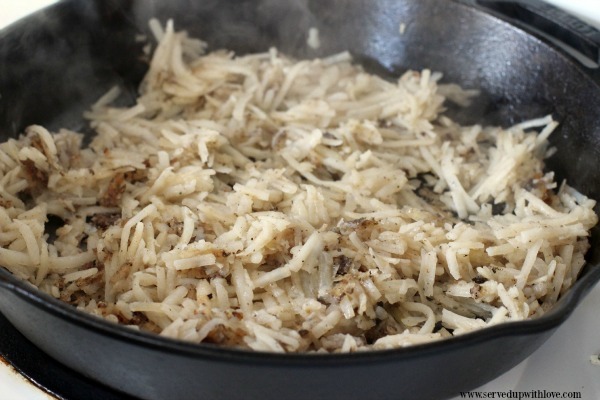 Add a little oil to your skillet and cook the hash brown potatoes on medium heat with seasonings until brown, stirring occasionally. Set aside. 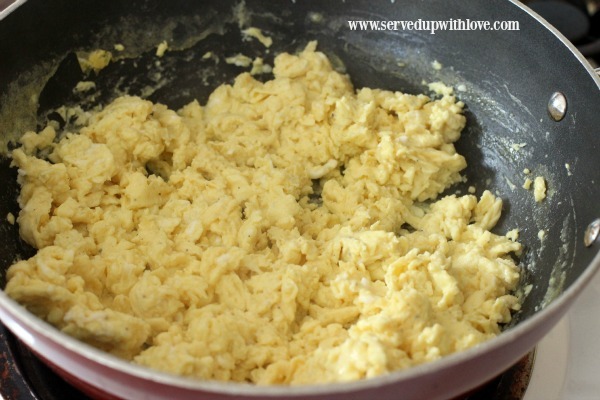 Next scramble the eggs over medium heat until done. Set aside. 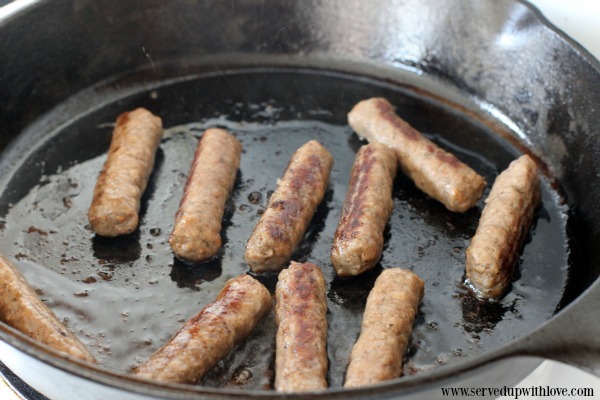 Chop the sausage links into smaller pieces. In the center of the tortilla, line up your ingredients. Sausage, hash browns, eggs, cheese, and rotel in no particular order. Fold the smaller ends over and roll the longer end over. With seam side down, place on a platter and continue to assemble. Serve right away or wrap in plastic wrap and place in a freezer bag for later use.